Ever wonder where the unemployment numbers come from? Ever wonder why you don’t seem to be moving forward and Washington is telling you how great the economic recovery is? Every wonder why you know a lot of Americans who have been unemployed for a long time and have given up searching for a job when the government keeps telling you that thousands of new jobs are being created every month? Ever wonder why your reality does not seem to agree with the reality you see reported on the news? Well, the world most of us live in is a little different from the world that the people writing the news, reporting the news, and working for the government live in. This article doesn’t need words–it just needs charts and graphs. 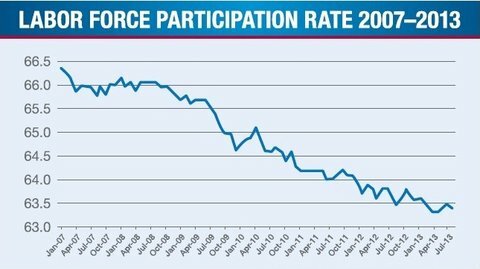 These are the real unemployment numbers–not the ones the Obama Administration is releasing–these numbers take into account the workforce participation rate. Our representatives no longer represent us. Nor are the bureaucrats in government serving the American people. It is long past time to clean house! President Obama has touted the ‘economic recovery‘ as one of his accomplishments. He might want to be a little quieter about that as the latest jobs figures and the numbers behind them indicate a very slow recovery. Yesterday Investor’s Business Daily posted an article about the jobs numbers just released. While last month’s overall gain of 38,000 jobs, including a 25,000 rise in private payrolls, was dragged down temporarily by the labor strike of 35,000 Verizon (VZ) communications workers, the weakness was broad-based. On net, just 51.3% of industries added jobs, the lowest since February 2010, Labor Department data showed. …One decent bit of news in the employment report is that the trend of firming wages remained intact, as hourly pay rose 0.2% from April and 2.5% from a year ago. That’s consistent with anecdotal reports of companies having to pay more to attract or keep good workers, and many finding qualified workers in short supply. …The drop in the unemployment rate to 4.7% from 5% in April appears at first to be consistent with a tight labor market. Still, the sudden drop in joblessness, which reflected fewer people in the workforce rather than an increase in employment, should be taken with a grain of salt, given the household survey’s higher margin of error. …The reality portrayed by the weak jobs report got some confirmation from the Institute for Supply Management’s survey of non-manufacturing industries, with the index slipping to a 28-month low of 52.9 in May from 55.7 in April — well below expectations. The employment gauge fell into negative territory, dropping 3.3 points to 49.7, just below the neutral 50 level. …Somehow, the retail sector has seemingly defied gravity when it comes to employment, adding 11,400 jobs last month and 323,000 over the past year. The explanation may be that the workweek has shrunk, since aggregate hours of work in the retail industry are down 0.3% over the past three months. So what is the bottom line? Workforce participation is down, job growth is slow, and the number of hours people are working has gone down. That doesn’t sound like a robust economic recovery to me. It is definitely time for a change of direction. As I have previously stated, I am not a Trump supporter, but I will vote for him because I believe that he may have the business experience to turn this mess around. So what does this mean? Breitbart.com posted a story about the numbers today. The labor participation rate is a concern. The unemployment rate does not take the labor participation rate into consideration–it is based only on the number of people actually looking for work that are unemployed. The current labor participation rate is not indicative of a healthy economy. Zero Hedge posted a story today on the latest jobs numbers. Our economy is not doing well. It is time for a change of policy. Right now, Scott Walker is the top Republican fund raiser in the Presidential primary. He is also a favorite of the conservatives, which makes him a prime target of attack for the Clinton machine and anyone out there on the liberal side of the spectrum that has designs on the presidency. Get ready for the attacks–here are some of the facts. Today’s Wall Street Journal posted an article about his record on employment in Wisconsin. Scott Walker took office in 2011. He faced a recall almost immediately, which he won. Despite the opposition, he continued his policies of cutting spending and lowering taxes. Yet Wisconsin’s employment-population ratio has jumped 2.5%—significantly more than the national improvement rate. Wisconsin is also gaining ground against other states. In February 2011 Wisconsin ranked 12th in employment-population ratio. It now ranks ninth. 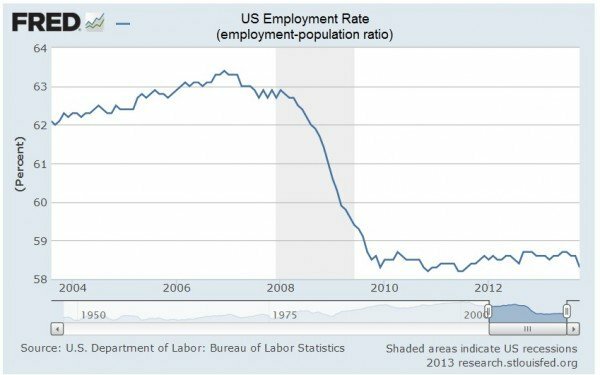 …The U.S. employment-population ratio has grown 1.5% since Mr. Walker took charge. Some will rightly point out that the unemployment rate fails to account for people who can’t find a job and stop searching. 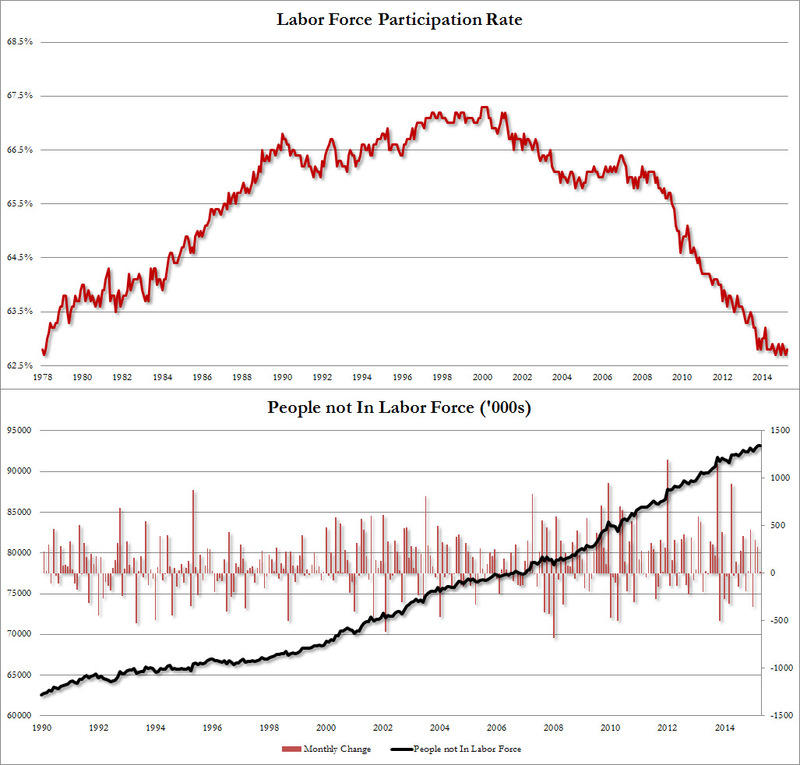 And so a low unemployment rate is more meaningful if it is accompanied by high participation in the labor force. 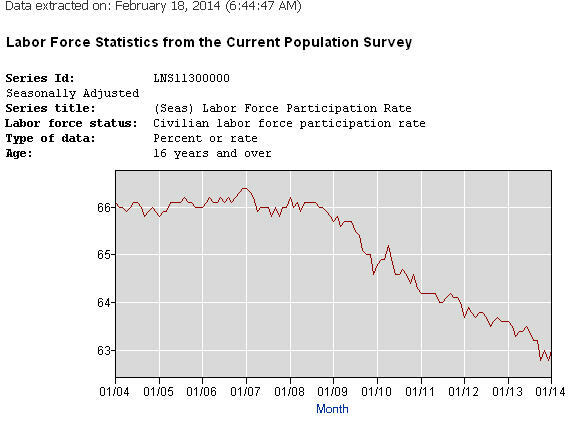 Since February 2011, the national labor-force participation rate has dropped to 62.7%, from 64.2%. Wisconsin’s rate, much healthier than the national average, has also declined but by significantly less, to 68.4% from 69.1%. Wisconsin’s current 68.4% labor-force participation rate is particularly noteworthy because it represents an uptick over the past year from a low of 68.1%. Nationally, the average labor-force participation rate has declined to lows last seen during the Carter administration. Given that Wisconsin’s unemployment has dropped to 4.6% from 5.6% in the past year, the state is in the enviable position of having lowered unemployment while increasing labor-force participation. Not surprisingly, this has helped Wisconsin move up to eighth place in state labor-force participation, from 12th in 2011. Keep these figures in mind as you hear the attacks on Scott Walker that will be coming from the political left. I have not yet made up my mind as to whom I am supporting in the Republican presidential primary, but these are impressive statistics. Yesterday The Federalist posted an article about the latest unemployment numbers from the Department of Labor. There was rejoicing that the unemployment rate had dropped to 5.5 percent. You might want to hold off on that rejoicing for a bit. As you can see, the actual unemployment rate is closer to 10 percent. 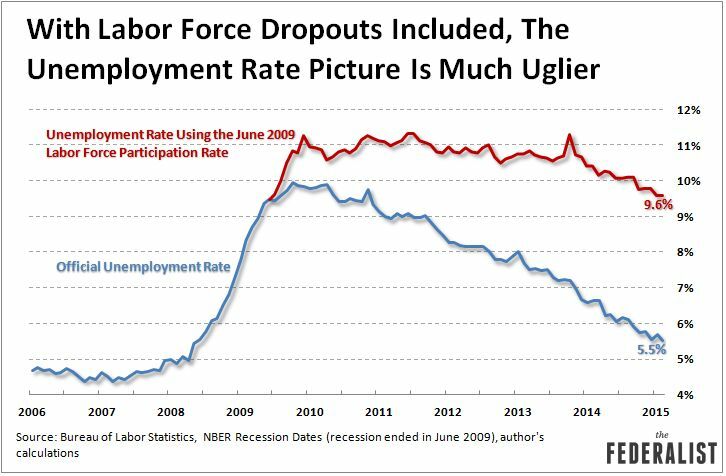 So, if you know anyone who is unemployed and can’t understand why it is so hard to find a job, show them the real numbers. It might make them feel better. This decline (the decline in the labor force participation rate) has significant effects on the official unemployment rate. People who are unemployed and eventually stop looking for work are no longer counted as being part of the labor force, which means they’re no longer counted by U.S. statistical agencies as being unemployed (you can read in detail about the math underlying this dynamic here). The result? 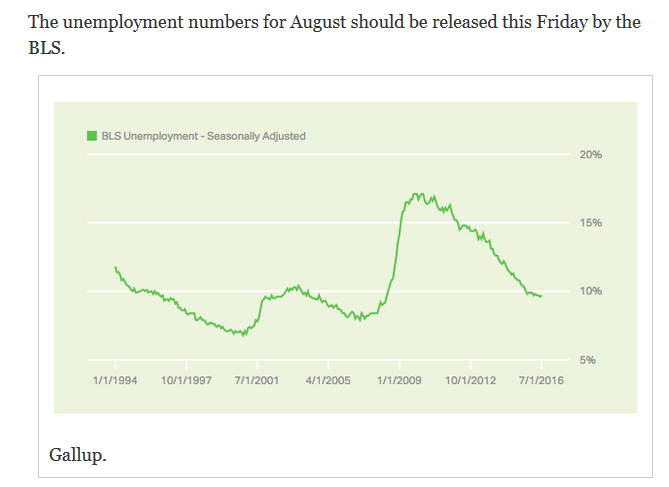 An artificially low official unemployment rate. It is an unfortunate fact of life that you can make statistics say pretty much anything you want them to say. 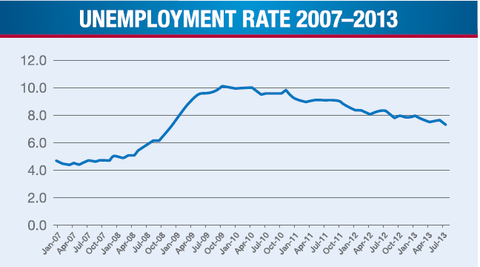 The National Review Online posted an article today about job growth since the recession began in December 2007. This might be something to consider when debating President Obama’s amnesty memo. I suspect there are two main reasons for this statistic–first of all immigrants (legal or illegal) may be willing to work for lower wages, and secondly, many immigrants may have a stronger work ethic than many Americans. Either way, this does not bode well for America’s future. The jobs report came out today. John Hinderaker at Power Line posted an article about the numbers reminding us that what we read in the media may not be the whole story. * The number of people aged 16 years and above who are not in the labor force increased by 111,000 this past month. While a somewhat lower increase than in months past, it still outpaces forecasted retirements. * The number of people taking part-time jobs because they cannot find full-time work increased by 275,000 this past month. * In fact, the number of people employed full-time (according to the household survey that also counts self-employed) declined by 523,000 while the number of part-time workers increased by 799,000 (which includes those who wanted part-time and those who wanted full-time but could only find part-time). These estimates are seasonally adjusted to account for the normal increase in June part-time work. * The U-6 unemployment rate (the broadest measure of unemployment) remains virtually unchanged at 12.1 percent. U-6 includes those people who are discouraged, only occasionally trying to find work, and those employed part-time for economic reasons. 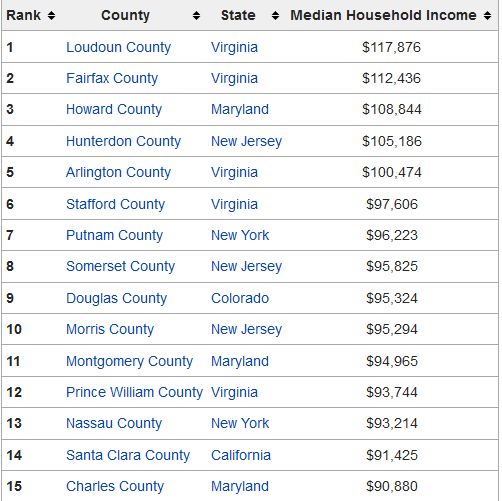 The article also reminds us that both incomes and economic growth remain flat. It seems as if the only thing growing in this economy is the Stock Market (which the government is currently propping up). 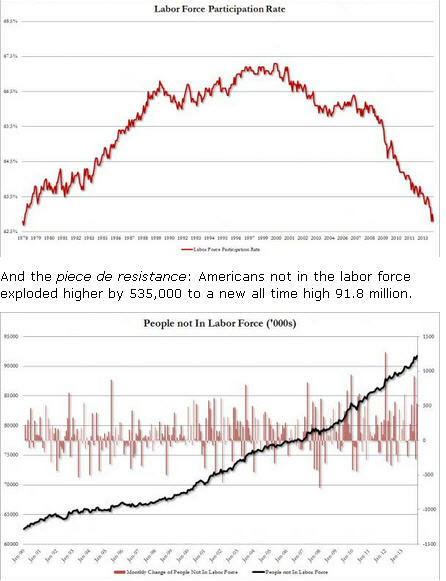 The two charts below are from a website called zerohedge.com. They were posted today. The article posted the charts to explain how the unemployment rate has gone from 7.0% to 6.7%. The unemployment situation for Americans have not improved–more Americans have given up and stopped looking for jobs. We are not in an economic recovery. Yahoo Finance posted an article today that included the Labor Force Participation Rate in the latest jobs numbers. The civilian labor force decreased by 37,000 to 155.80 million in July, while those not in the labor force rose by 240,000 to 89.96 million. The decrease in the percentage of Americans in the labor force–63.4% last month from 63.5% the month before–is one of the main reasons for the drop in the unemployment rate–to 7.4% in July from 7.6% in June. Many of the jobs added were part time jobs and many jobs changed from full time to part time. ObamaCare has created some serious problems for the American economy (ObamaCare is responsible for the growth of part time jobs) and will continue to do so until it is defunded and stopped. I am not sure if the Republicans in the House of Representatives are going to get anywhere with their attempts at defunding it, but I give them credit for trying. Investors Business Daily posted an article today on the latest jobs numbers. Although somewhat better than expected, the 175,000 net jobs created in May continues the historically tepid jobs growth trend that has come to characterize the now four-year-old economic recovery. The result has been continued high unemployment, a vast pool of long-term jobless, and an unprecedented number of people who’ve dropped out of the labor force. The article reminds us that there are 2.4 million fewer people working than there were in January 2008. The Democrats have attempted to blame the slow job growth on sequestration, but that doesn’t make sense. Sequestration did not go into effect until March, and sequestration cut the rate of growth–it did not cut the budget. …the total number of government jobs climbed more than 7,000 since January (not including U.S. Postal Service jobs, which get included in government statistics even though the USPS is independently run). It really is time to shrink the government. It is ridiculous that as the number of people leaving the workforce increase, the government continues to grow.